After breakfast its time to head towards the big river. The first part of the morning is spent explaining the finer points on how to paddle through whitewater. 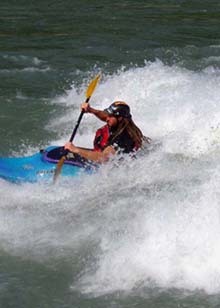 You will encounter numerous smaller rapids on the first two days of the river followed by the more meaty Meat Grinder, High Anxiety and Harkapur. After stopping at Tokshel Harkapur and spending time checking out this porter town we drift down to a rapid called Harkapur 2 and camp for the evening. The famous Dudh Kosi, the river of milk, which tumbles down from Mount Everest forms the next rapid followed by Jaws, then Dead Mans Eddy and cascading water falls. We will then have at least one layover day staying at the same river camp for two nights.